"It sure does look like Texas". And this feels like a Texas fever dream as imagined by a californian woman. Or three. Plays like Altman reaching for Bergman's PERSONA in his relaxed way; too bad this very tense yet hazy, eerie shape is betrayed by the obtrusive score. A strange enigma of a movie. While it is quite fascinating, it also seems to me to have failed to establish any real presence; as scenes and moments flicker by, they just sort of disappear, so I'm not sure what to feel ultimately. Nifty film about what seems like mostly women interacting, though is really some bizarre underlying musings on influence, persona swapping, and other peculiar notions of identity -- sounds pretentious, but it's housed in an absorbing and watchable story. I can dig the vagueness, but things get a little too loose towards the end, making the inconclusiveness seem actually half-baked and unsure of itself. Once it takes its turn, it starts to find its footing. I enjoyed seeing Spacek and Duvall work together. The world in the film completely dismisses them, and all they have is each other. Everything dealing with their relationship and all the awkward social interaction was very interesting to me. I could live without all the surreal stuff though. There's some neat imagery, but it felt pretty meaningless overall. Sociopaths, feminism and creepy editing are things I love so when I see them together I tend to appreciate the package even if I can't figure out the interfaces. 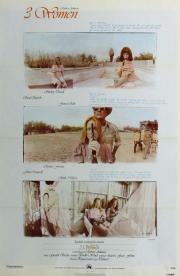 My favorite Altman's movie, and simply one of my favorite movies. Altman "meets" Lynch.